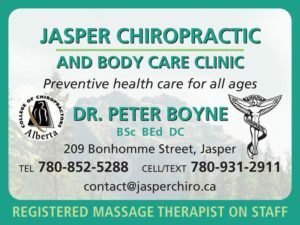 Frequently Asked Questions about Private Home Accommodation (PHA) and B&B in Jasper and area. What is a "private home accommodation"? What is the difference between "home accommodation" and "Bed & Breakfast"? Where, in the host's home, are the guest rooms? What is an "ensuite" bathroom? What is a "shared" bath? Why do some hosts want a deposit? What about payment by credit card? 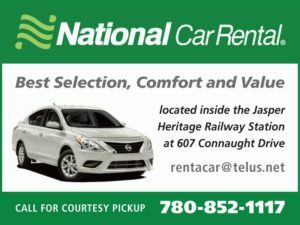 What is a "cancellation policy"? What methods of payment are acceptable at home accommodations and B&Bs? 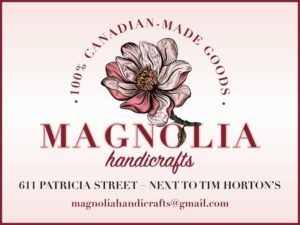 Are prices in Canadian or American dollars? Do accommodations charge the 4% Alberta Tourism Levy or the federal GST (Goods & Services Tax) of 5%? Do Private Home Accommodations have air conditioning? 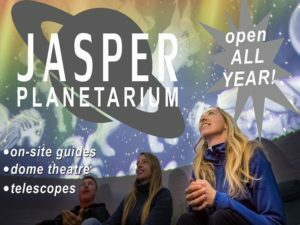 Do I need to make an advance reservation? 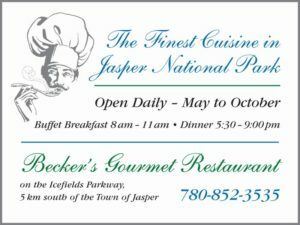 If I come to Jasper without an advance reservation, where can I find out about vacancies? Are children welcome at private home accommodations? The accommodation that I am interested in is advertised for a maximum of four people. Can I bring a foamie and sleeping bag for a fifth person? Can my pet stay with me? Who regulates home accommodations and Bed and Breakfasts? 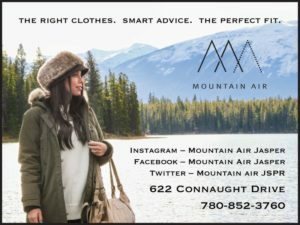 Where can I find an entire house to rent in Jasper for my vacation? 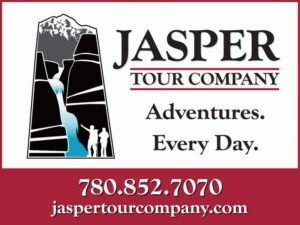 I will be working in Jasper for the summer. Do private home accommodations rent to summer residents by the month? 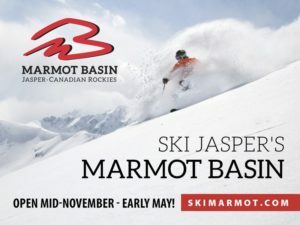 When is "high" season? When is "low" season? What is a "self-catered" breakfast? What is a "continental" breakfast? 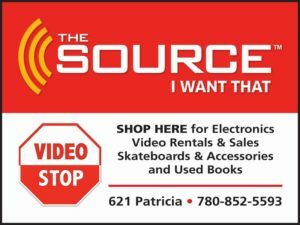 How are room rates quoted on this site? Are discounts offered? 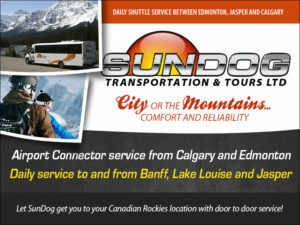 The rates quoted on our site are in Canadian dollars. To convert to your own currency, use one of these currency calculators. Private home accommodations (PHA) are guest rooms for rent to overnight visitors in a private home. The guest rooms may be a part of the host's living quarters - an upstairs spare bedroom - or may be a completely self-contained unit, anything from just a basic bedroom, to a cozy bed/sitting room to a one, two or three bedroom apartment complete with kitchen. In Jasper, PHAs must be operated by a home-owner living in the home, and are not permitted in rental properties. Several homes offer breakfast, however, most do not. Some home accommodations are Bed & Breakfasts, however, most do not offer breakfast unless otherwise noted. Bed and Breakfasts are required to meet stringent provincial food regulations, and to pass inspection by the Public Health Inspector. 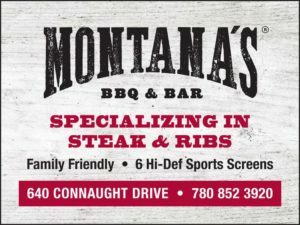 They must display a valid Alberta "Food Establishment Permit" prominently. Breakfast must be included in the room rate rather than as an additional charge. 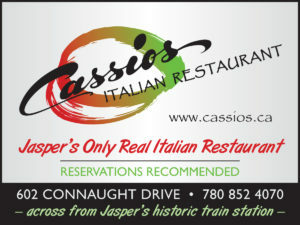 Many home accommodations offer a kitchen, or a fridge and a microwave for their guests to prepare their own meals; Jasper also has many fine restaurants. The practice of offering overnight accommodation to visitors with no breakfast arose from years of regulations that did not permit breakfast service. 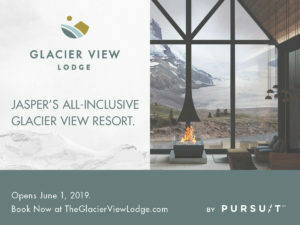 The regulations have changed, and breakfast is now permitted subject to meeting Alberta Health standards; however, private home accommodation continues to be popular with many visitors. 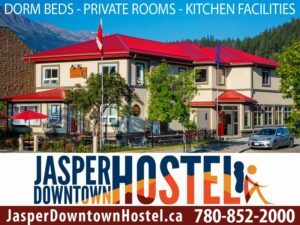 Both types of accommodation are available in Jasper. Private home accommodations are operated by the person(s) who own the home and live in it. 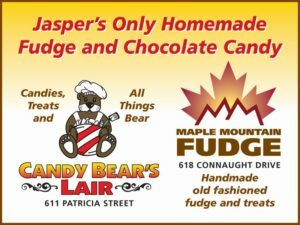 Many hosts in Jasper are families. If the host is temporarily absent - for instance, away on vacation - they are required to have someone living in the home to attend to guest needs in their absence. Guest accommodations may be upstairs bedrooms, just down the hall from the host's, or they may be on the main floor of a home, perhaps with their own entrance from outside. PHAs are sometimes in the lower level or basement of a home. However, lest you imagine dingy, damp, dark cellars, be assured that government inspections and licensing require that strict National Building Code regulations be adhered to, no matter what part of the house the rooms are located in. 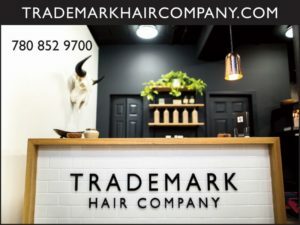 To protect your health and safety, these regulations address topics such as the size of the bedrooms and of the required windows, the number of occupants and bathroom facilities required, and fire safety standards - the availability of exits, and smoke detector and fire extinguisher location. Many homes have "daylight" or above ground basements, with lots of windows, sunlight streaming in, and mountain views. 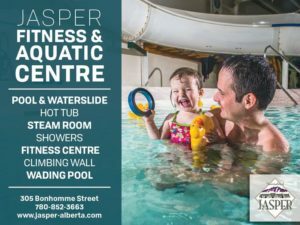 With Jasper's dry climate, dampness is usually not a problem, even in basement rooms. If location of the accommodation is important to you, or whether there is a view from your room, be sure to ask your host for a precise description. This term comes from the French term "en suite", which means, literally, "in the room". An ensuite bathroom is connected directly to the guest room, that is, you do not have to leave the guest room to access the bathroom. A "private" bathroom may or may not be "ensuite" - sometimes, while the bathroom is for the exclusive use of one guest room, it may be down the hall from the room itself. A bathroom may be shared between two or three guest rooms, or with the hosts. Sometimes more than one shared bathroom is available. Alberta Health regulations require at least one bathroom for every six people. Just a note about homes with a "shared" bath - when a bathroom is shared between two or three guest rooms, if you book all of the rooms that share a bathroom, the bathroom is essentially "private" to your party. 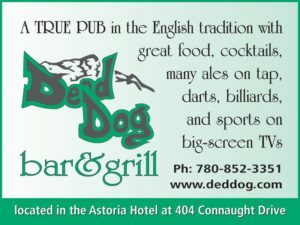 Some hosts will ask for a deposit to confirm a reservation; often it's the amount of the first night's charge. A deposit protects both the visitor and the host. With a confirmed reservation, the visitor is assured a place to stay, and the hosts, having already rented the accommodation, will not be turning away other potential guests only to have the room sit empty. The host should inform the guest of their cancellation policy when requesting the deposit, and again when confirming the reservation in writing. Hosts are only permitted to request your credit card number if they have a merchant account with that credit card company. One of the terms agreed to when establishing a merchant account is that the host must accept the credit card as final payment from the guest, if that is how the guest chooses to pay. Be aware that if you book with someone who asks for a credit card number to guarantee or confirm the reservation but who will not accept payment by credit card, they probably do not have a merchant account and are probably not able to process credit card transactions. Requesting your credit card number to confirm a reservation without being authorized to do so is not only a fraudulent practice, but also against our association's standards. Please send any concerns here. It is the terms under which a host will refund your deposit if you cancel a confirmed reservation. Each host has their own policy. Some deposits may not be refundable within a specific period of time, or a cancellation charge may apply. 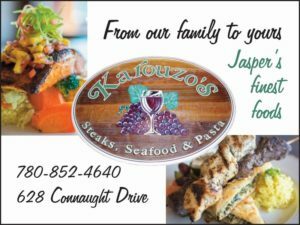 Be sure to ask your host when you make a reservation. While some hosts can accept credit cards, many do not. Ask your host. Cash and traveller's cheques are always welcome; you should ask your host's policy if you wish to pay by personal cheque or in American funds. Regardless of how you pay, your host is required to provide you with a receipt. Prices quotes in our association listings are all in Canadian dollars. American funds are readily changed at banks and currency exchanges; many businesses will accept U.S. money as well, although their exchange rates may not be as favourable as bank rates. You should ask your host whether they accept U.S. currency if that is how you wish to pay. Accommodations offering three rooms or less are not required to charge the provincial Tourism Levy. Most private home accommodations are under the income threshold that requires them to collect GST. Canadian law requires that businesses charging GST must include the amount of the tax and their GST registration number on your receipt. 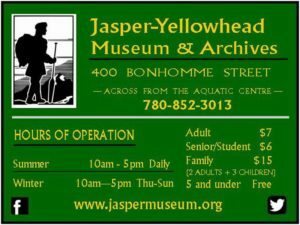 Private home accommodations and Bed and Breakfasts in Jasper are REQUIRED to issue a receipt for any and all payment received. Usually not. Very few homes in Jasper are equipped with air conditioning, simply because it is not needed. 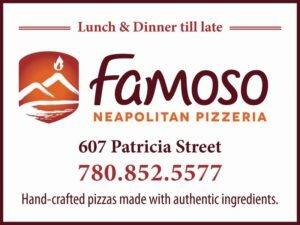 Summer nights in Jasper are not "shirt-sleeve" weather - be sure to bring a warm sweater or light jacket. 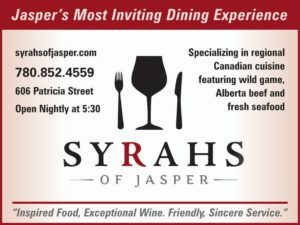 Even in the hottest part of the summer, Jasper's evenings and nights are cool - usually between 45 and 60F, or about 7 to 15 degrees Celsius. Even when a home heats up during the day, a little ventilation once the day cools down ensures bedrooms are comfortable for sleeping. 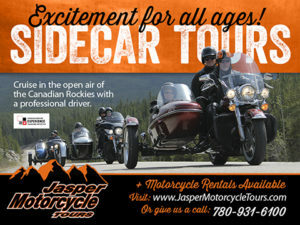 Jasper is a beautiful resort town in spectacular surroundings, and tourism is the largest industry. 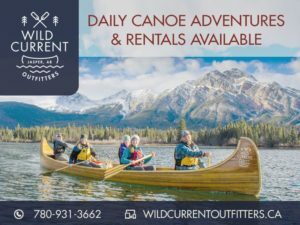 July and August are the busiest months, and sometimes - especially holiday weekends - the entire town sells out completely - home accommodations, hotels, motels, youth hostels, and campgrounds. It is an hour's drive, in any direction, to the next town. So, it is advisable to plan ahead, especially in peak season. From May through September, a Daily Vacancy List is posted at the Parks Canada Visitor Information Centre. Home-owners who wish to advertise a vacancy do so by adding their name to the list. 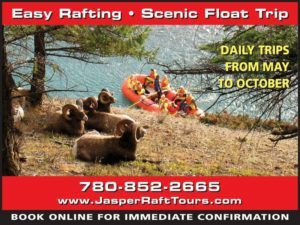 Two courtesy phones are provided by Jasper Tourism and Commerce to assist visitors. 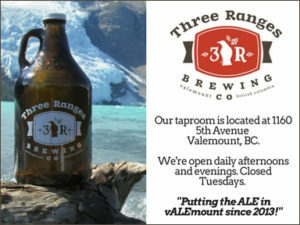 From October to May, the vacancy list is posted weekly or bi-weekly. 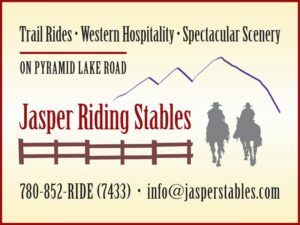 If you would rather have someone else find accommodations for you, there are also several reservation agencies in Jasper. 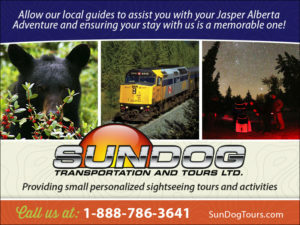 Many of these can also make bookings for you for sightseeing excursions and activities. Ask your host what their policy is regarding children. 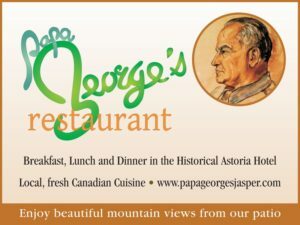 Most home accommodations and Bed and Breakfasts welcome guests of all ages, although some may be recommended for older children only, especially if gourmet breakfast service is offered, or if the décor includes antiques or breakable objects. Home accommodations are subject to strict occupancy limits to protect the guests' health and safety. The availability of bathroom facilities and fire exits, the size of rooms and the beds available are all factors that determine the capacity of guest rooms. Additionally, hosts are licensed for, and hold liability insurance for, a maximum number of guests. There are homes available to accommodate up to eight guests. If you are travelling with an animal, check with the host before booking to ensure that your pet is welcome. Some hosts are allergic to animals and cannot have any in their homes, or they may have pets of their own who may not always welcome strange animals into "their" territory; some accommodations cater to travellers with allergies and do not permit any animals in their rooms. Many private home accommodations and Bed and Breakfasts do not permit smoking indoors in their homes, but may provide somewhere for smokers to sit outdoors. (Please be considerate and use the ash-tray provided instead of the host's flowerbeds!) Ask your host before you light up, especially if no ash-trays are apparent. 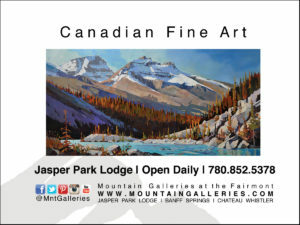 In Jasper National Park and the townsite of Jasper, Parks Canada, an agency of the Canadian government, is responsible for reviewing and inspecting all private home accommodations. 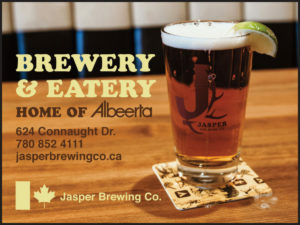 Business licensing and bylaw enforcement is done by the Municipality of Jasper. Licensed homes in Jasper must display a standard sign on the exterior of their house. Look for the small green and white square with the accommodation icon, a bed underneath a roof. Licensed homes must also display a copy of their business license in their guest room(s). 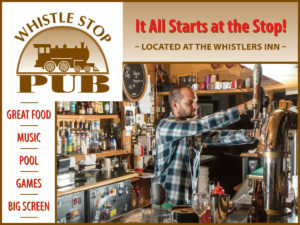 Where breakfast is offered, all hosts must also have and display a valid Alberta "Food Establishment Permit", which signifies that they have been inspected by the public health inspector to ensure they meet health and food safety standards. It is not possible to rent a vacant house in Jasper by the night or by the week. Because Jasper is in a national park, all development is strictly controlled. To ensure that the park remains as wilderness, the boundaries of the town are fixed; the town cannot grow any larger. Almost no land is available for further development, and housing is already scarce for those who live and work in the town. Consequently, all residential properties must be occupied by someone with a "need to reside" in the park - or by someone who worked in the park for at least five years before retirement. In most cases, no. Home accommodation is intended as nightly rental to visitors. Renting a private home accommodation would generally not be economical as a monthly rental, especially in peak season. 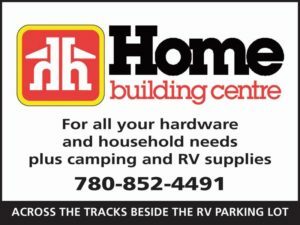 Rental housing can be difficult to find in Jasper at any time of the year - during the summer months, when thousands of summer workers arrive, the vacancy rate gets even tighter. 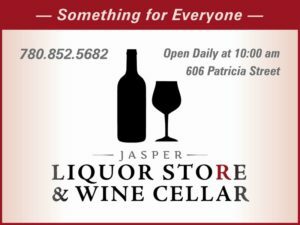 Job seekers are encouraged to make arrangements prior to arriving in Jasper. Many employers offer staff accommodation. High season is the summer. Low season is the winter. 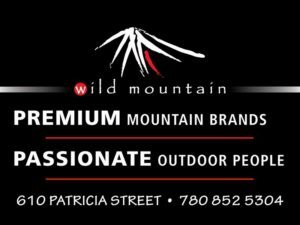 The exact dates used to define high and low season, ski season, off-season, shoulder or value season are set by the owners of each home accommodation or B&B. Please enquire with the host. The summer tourist season runs from approximately the Victoria Day long weekend (mid-to-late May) to the Canadian Thanksgiving holiday weekend in mid-October. Some homes define this entire period as "high season"; others, only the months of July and August. 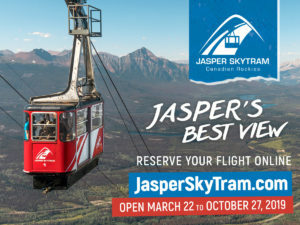 Ski season in Jasper generally runs from December through late April. A self-catered breakfast generally means that the host provides breakfast foods for guests to serve themselves. This is often a "continental" breakfast. A continental breakfast is usually a light breakfast that may include bread or baked goods, coffee, tea, juice etc. 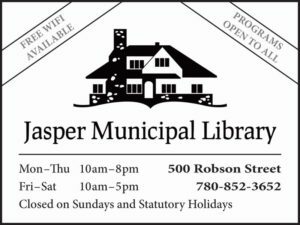 Jasper - the town - has a permanent population of 4500. Physically, the town is only about four kilometres (two miles) long from one end to the other. The downtown area, where most of the shops and restaurants are located, is located in the centre of the town. 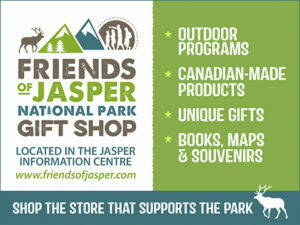 Jasper - the park - is very large - 10,878 square kilometres (4,200 square miles). 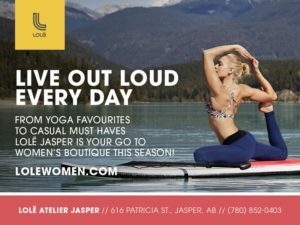 The town of Jasper is located approximately in the centre of the park, with access to the town from the south, by highway 93, the Icefield Parkway, or from the east and west by highway 16, the Trans-Canada Yellowhead highway. Jasper National Park is the largest and most northerly of the four Canadian Rockies national parks, and part of a UNESCO World Heritage Site. The rates quoted in each listing are per room, based on double occupancy (two guests sharing one bedroom). A "per extra person" rate may be indicated if a room can accommodate more than two guests. Some home-owners have rooms with different rates (for instance, if one room is larger than another, or if one has a kitchenette), and they may indicate a range of rates to show that their rooms are not all the same price.